It seems I have been hearing an awful lot lately about Ethiopian food. Or perhaps it’s a case of selective hearing. I have been tempted by the cuisine for a long time, but shied away from it when led to believe that the injera (a spongy flat bread essential to an Ethiopian meal) is often made with a blend of teff (a gluten-free grass indigenous to Ethiopia) and wheat flours. So, I filed Ethiopian food in my drawer of deprived pleasures. Which brings me to the other night at the contemporary American restaurant, Jackie’s, in Silver Spring, MD. Our good friends, “The Oreos”, introduced us to this beacon of deliciousness in a sea of mediocre Silver Spring establishments. Located in a converted auto parts garage, the restaurant breaths a 60s industrial-chic ambience. The cocktail and food menu reverberates the same “cool” vibe and fuses an assortment of flavors from around the world with seasonal, organic, local ingredients. For starters, “Guacamole with fresh radish, cucumber and jicama slices” is listed right above “zucchini cups with halloumi cheese and spicy sesame sauce” (both gluten-free). Several items sounded tempting. But then my eye scanned down to the entrees and stopped at the very first one. 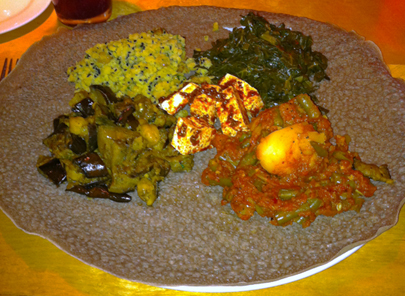 Jackie’s offers an “Ethiopian inspired vegetable platter served on local teff injera.” This injera is authentically made on sight with teff flour only, and the day’s vegetarian wat (thick stews) were gluten-free as well. “Glutie Foodie”, I said to myself (maybe out loud a little), “now is your chance” (the Oreos looked confused). The platter arrived and commandeered a good portion of the table. My eyes widened and I inventoried my winnings—scoops of green beans in a tomato base, sweet lentil puree, garlicky eggplant with chickpeas, salty collard greens, and spicy tofu, all on a giant g-free pancake. With a napkin in my left hand I dug in with my right. Each stew complimented the other with a diverse range of flavors, spices and textures. Ethnic authenticity is beside the point for this American, farm-to-table rendition of an Ethiopian meal. It did not disappoint. My chosen liquid pairing furthered the meal’s cultural confusion. The blackberry lime margarita, made with Hornitos Reposado, triple sec, blackberries, lime juice, and a salted rim, is surprisingly more tart than sweet. This refreshing cocktail provided a nice buzz and a smile, rather than a cavity. Topping off our world tour was the I-can’t-believe-it’s-gluten-free “Bittersweet Pavé”—flourless chocolate cake with sesame caramel and orange whipped cream. The sesame surprises the senses as a welcome compliment to the fluffy chocolate cake, which was just rich enough to split four ways. Chef Diana Davila-Boldin creates confident dishes that flatter rather than imitate traditional cuisines. Her culinary riffs celebrate ethnic inspirations in American food. Ingredients and menu items change seasonally, which means come the winter months, a whole new list of inventive concoctions are in store. Despite menu change-ups, the staff knows their stuff and is happy to provide accurate gluten-free information. The kitchen is agreeable to modifications, as we found out when Mr. Green Bean ordered his Amish Chicken sans “bleu cheese potato mash, beets, fennel and watermelon”. He just wanted a side of green beans. Oye. Categories: 4 Spoons, American, Ethiopian, Gluten-Free, Maryland | Permalink. Yum! Take me back there with you! Also, that last paragraph was beautifully written, almost poetic. Sounds wonderful! I want to go sometime!!!! You’re collecting a whole bunch of restaurants for us to try when we visit! Sir Green Bean needs to step up his Ethiopian game. Makes me want to drive to Silver Spring! I think ‘Mr. Green Bean’ creates a bigger problem for restaurants than you! Etete Resturant in DC is accommodating… I picked up pure teff injera from the local market. Etete in DC is accommodating… We got 100% teff injera from the market on the street. What a great idea to bring your own injera. I’ve been wanting to try Etete and now I can. Thanks for the tip!